Registration for ALRID Members with any membership level. Registration for students currently enrolled in an Interpreter Training Program. Proof of enrollment may be required at check-in. Registration for individuals who are not currently members of ALRID. 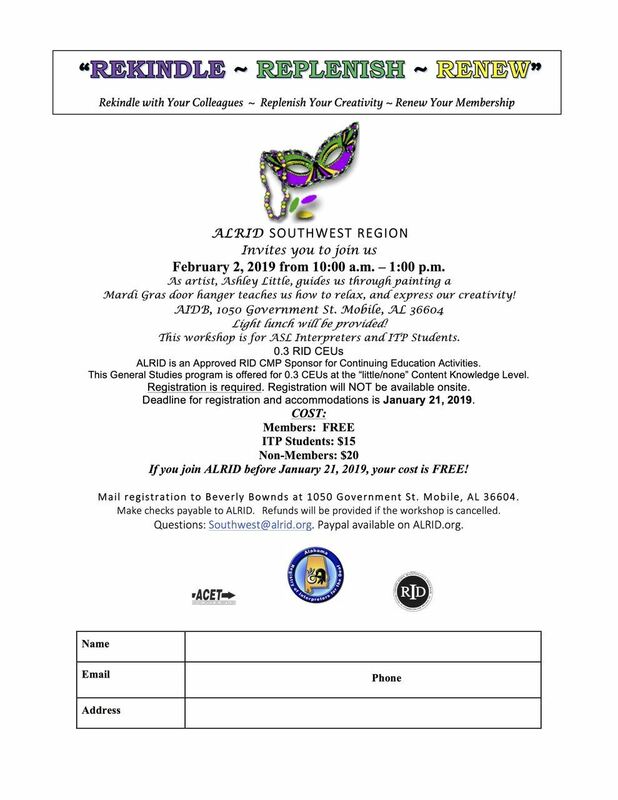 ALRID Southwest Region invites you to join us as artist Ashley Little guides us through painting a Mardi Gras door hanger, teaches us how to relax, and express our creativity! A light lunch will be provided. Registration for this event is required. Onsite registration will not be available. Print the registration form HERE or continue and register online! Deadline to register/request accommodations is January 21, 2019.